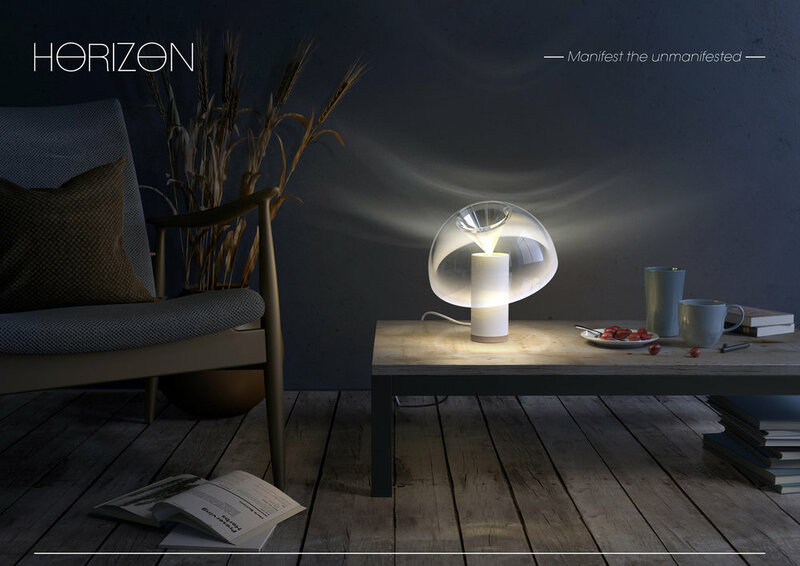 Concept Statement: HORIZON is a table lamp designed to create a warm and lively atmosphere. A loosely floating lampshade, balancing on a single point, creates a dynamic lighting effect on the surrounding surfaces. The invisible interplay of forces around us is transformed into a visible phenomenon, providing a relaxed and candle-like coziness. A mirrored surface reflects the light rays coming from the lower part and spreads them in different directions. On one hand, creating soft caustic effects on the surrounding vertical surfaces. On the other hand, providing a subtle glow that brightens up the horizontal plane. And at last, projecting an oscillating pattern on the ceiling that intensifies the balancing movement. Its morphological aspect enhances the pivot point, through which two simple geometrical shapes become one inseparable whole. Light + Balance creating a subtle moving horizon that invites to dwell and dream. Project Specs: General dimensions: height: 280mm, ø280mm The luminaire consists of two separate elements, a cylindrical body and a cupola. The cupola is a transparent half-sphere from PMMA with a cone in its center hosting a radial mirror. The cylindrical body contains all the electrical components and the light source. It is assembled from two main aluminum turned parts. The tube-like housing sits on top of a small circular pedestal, acting as the control-switch when being turned. Bio: MIRSON+KLAAS. Product+Lighting Design. Studio based in Berlin, Germany. We focus on the relationship between light and spatial perception. We explore how light and its qualities create new experiences and atmospheres. We develop products understanding light as a phenomenon that can transport us to contemplate and admire our surroundings. Launching our first product HORIZON on the competition LAMP 2018. Concept Statement: Balance isn’t something you easily get, it’s something you have to gain. Universe itself is constantly searching for its equilibrium, balancing different elements to reach an ideal condition. Similarly, BOLLA is able to constantly equilibrate power and temperature to guarantee the desired lifetime of its LED. Heat dissipation is a crucial point of development in lighting. BOLLA uses a smart sensor to dimmer the power and hence the brightness depending on how much heat the surrounding element can dissipate. The result is an incredibly thin light body: without any kind of heatsink it can adapt to mutable conditions. This system creates an unique human interaction: when the LED is inside water you have a powerful bright light, diffused by water itself. When taken outside, in the air, the light is soften and the beam become direct, using water as a natural lens. 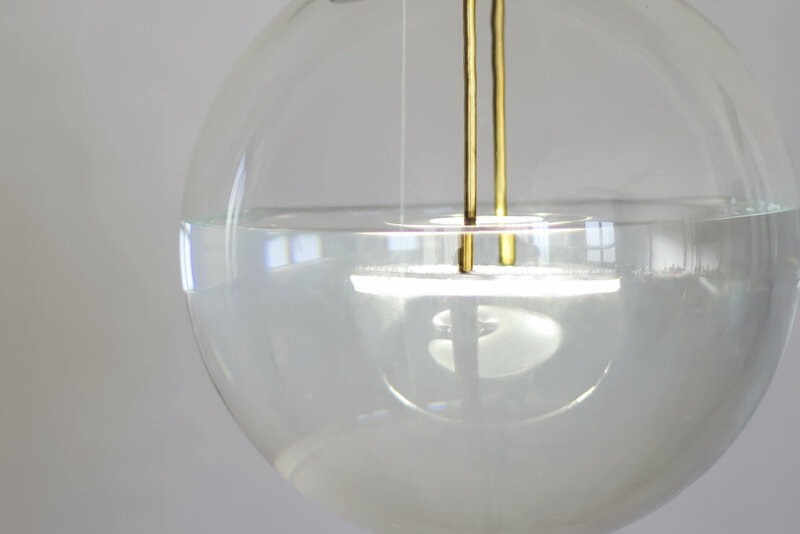 Bio: OliveLab is a manufacturing and consultancy practice aiming to produce a new generation of lighting products. Attracted by innovations and new technologies, we see light as one of the more important resources of our life. The poetic but functional aspect of lighting take us to design new products focused on the true needs of the final consumer. Putting together our creativity, ideas and experiences we apply the same rigorous attention to context, quality and detail. Concept Statement: Fluid moves mysteriously. The behaviour is a result of complex interaction between different aspects of matters such as speed, mass, weight, temperature… Only once all these aspects affect together cohesively, the pattern evolves. Traditionally and most of the time, the only ways to capture it is through aid of photographic techniques. However, nowadays, through the use of computer simulation technique, we are able to generate and capture number of fluid patterns while they are precisely on their most beautiful moments and not only in 2D but also in 3D. The Frozen Fluid is a series of porcelain lamp that is capturing moments of fluids in 3 dimensional sculpture which is only enabled by the use of computer simulation and digital fabrication technique. It is a result of dynamic flow of digital particles which sometimes looks like liquid fountain, sometimes looks like column of fast spewing smoke depending on the observers. Project Specs: DIMENSION: -Lamp_01: 10 cm X 10cm X 20cm -Lamp_02: 15 cm X 15cm X 40cm -Lamp_03: 18 cm X 18cm X 50cm -Lamp_04: 21 cm X 21cm X 60cm MATERIALS & PROCESS: The lamp is initially executed through SLA 3D printing technique and through several mounding processes and finally slip cast out of thin layer of porcelain which is strong, light weight and translucent. It is possible to come with different colors and finishes. Bio: Soomeenhahm Design Ltd is a London based design studio focusing on design research and practice tackling the issues of computational paradigm in architecture across multiple scales and perspectives. The research looks at the ecology of computer generated models, digital fabrication technologies, craftsmanship and human intelligence, see how this collaboration impacts on the design industry and physical environment. Concept Statement: In order to strike a balance and arrive at the stage of equilibrium, one has to constantly response and adjust to the environment. Hence, finding balance is a journey of actions and reactions instead of a finite destination. We invent Turner Lamp not only as a tool to let the users experience the actions of balancing an object, but also as a lighting fixture that can flip to create direct, indirect, and diffused light to balance different needs of the users and lighting scenes. No matter how you turn it, Turner Lamp always maintains its balance in proportion as a ring of tetrahedrons. Project Specs: Tuner Lamp is made of heavyweight recycled vellum paper and fabric sewed together and constructed by origami paper folding techniques. It has energy efficient remote controlled RGBW-LED as light source. Each Turner Lamp consists of six tetrahedrons. Overall Dimension of Tuner Lamp is 10.5”(w) x 12”(l) x 6”(h). Bio: SX2 is founded by Sanny Ng and Sunny Wang who are designers working in New York City. With strong interest in computational design and trans-disciplinary applications of emerging technology, they are both endeavoring to push the envelope of their practice through cross disciplinary collaborations, teaching, and researching. Concept Statement: Tilt is a sculptural work that plays with visual stimulation by combining mechanical physic forces and juxtaposing concepts to generate balance. Using tension as a counterpart of unbalance to create harmony and equilibrium. Using balance by creating shadows in the day and light in the night. A constant play of juxtaposing balance. The work aims to generate in the viewers an initial sense discomfort, but invites them to look further and come to sense harmony. The main design challenge is to make it stable without being compromising the visual design while concealing how has the work been balanced. Concept Statement: By allowing gravity to weight the center, the Highwire maintains balance by creating tension between two points. The user can add up to five luminaries to a single power drop. The Highwire uses electrical cables to create black outlines by tracing forms into a three dimensional space. These compositions are further enhanced by the light emanating from both sides of each individual weighted mass. The light created by the fixture not only illuminates the surrounding area, but also illuminates itself further enhancing the fixtures presence. The life cycle and energy efficiency of Highwire is crucial. By utilizing LED technology and minimizing manufacturing processes. Bio: ANONY is a lighting and product design studio founded by Christian Lo and David Ryan. Their interest in utilizing the latest technology and manufacturing processes is combined with an honest and timeless approach to a product’s life cycle judicious use of materials, minimal manufacturing, and ease of use. Through this philosophy, ANONY hopes to create products that produce an emotional response similar to the appreciation felt for the utilitarian yet well-designed objects of decades past. Concept Statement: When I think of “balance”, I am immediately drawn to the struggle of finding balance between work, play, rest, and home, and how complex it is to maintain this balance. The iconic scale with two scale pans and a single fulcrum, just doesn’t seem to be a relevant representation of the complexities of finding balance in today’s world. I used this iconic symbol as my departure point and began a deep dive into “what is balance?”. I looked to the natural world for inspiration, as nature is the master of balance. Objects in nature have an inherent sense of balance, even when they are visually off centre. I believe this is achieved through their pattern language (golden ratio, Fibonacci spiral, the flower of life, etc). I pulled upon all of these patterns to unravel a final form that is hoped to give a sense of balance and peace when experienced. Bio: SHIPWAY living design Romney Shipway, Owner/principle Through my practice, I strive to create meaningful contemporary objects and spaces that reflect the beauty of the natural world, while respecting it by using the most environmentally sensitive materials possible. I get most of my inspiration from the natural world that surrounds us, specifically the forests and the ocean that make up the beautiful west coast of British Columbia. Place of Origin: Vancouver B.C. Concept Statement: To be balanced means, find your own point of few and this happened with changing your perception. The fear of change often lies in our high expectations and a specific goal. We forget that the path and associated development need time. I use geometric shapes which use the metamorphosis from angular to round to symbolise transformation. Interaction with the observer is achieved through the lights spatial orbit and the resulting change of form. It creates a connection between the object and existence, ensuring change remains a visible part of our life. Bio: Florian Freihöfer is a product and furniture designer from Munich, Germany. After working in different fields of work, Florian Freihöfer transformed his life experience into the area of design. He is constantly changing his point of view to create new ways of thinking and designing. Concept Statement: Killay is a lamp whose geometry and materials evoke balance and simplicity. A slim piece of oak into a dodecagon steel body. Light emerges magically. It stays off while the oaken arm remains horizontal. As you rotate the lamp, the light intensity increases until it reaches its climax, coinciding with the pole in a vertical position. The tension generated from the stillness, the perennial equilibrium and the magic of light transform it into an object of desire. Project Specs: The intensity of the light is controlled by a microprocessor with an accelerometer that measures the angles. Both the driver and the first-rate OSRAM LED bulb have been exclusively designed to meet the conceptual, functional and kinetic needs of Killay. Concept Statement: This lamp presents unique features and offers an unmatched user experience.Its structure is made up of a series of rings in different sizes, kept in BALANCE by a sophisticated system of tensioned steel cables. Each ring is crossed by a set of elastic fabric ribbons. The rings are not fixed but free to slide up and down. By holding one and shifting it, it is possible to change the configuration of the whole lamp. The strips that make up the lampshade are constrained by the rings and shaped by their movement. The light is filtered through the strips and forms ever changing light patterns on the surrounding surfaces. By moving the rings the user can chose how much light to let through and how much to block, generating a BALANCE of light and shadow in the room. Directly acting on light the user learns how to BALANCE it. Project Specs: Dimension of the lamp is approx. 400mm x 400 mm x h.1000 mm Materials are laser cutted methacrylate, textile and aluminum. Bio: Umberto Garcìa is a product designer with Colombian, Finnish and Italian origins. Since the very beginning of his career, he shared his passion for light. The aim at the base of each project is not to design just another product but to deeply investigate the theme of light in order to create unique lamps. Umberto Garcia Design is a studio based in Milan.